In this case of COPD and smoking, the one is a cause of the other. Smoking is a recreational and social habit that may lead to serious health issues. It damages the airways, air sacs, and lung lining, often to such a degree that the impaired lungs are unable to allow air movement. The long-term effects of smoking may eventually lead to chronic obstructive pulmonary disease or COPD. The act of smoking has become a common social sight. In essence, smoking involves the burning of a substance (in this case tobacco), the smoke of which is then inhaled. Some of the components are absorbed in the bloodstream, others remain in the respiratory tract while the rest is exhaled. Smoking is reasonably common, with more than a billion smokers worldwide, according to the WHO. It is often used recreationally, the smokers often start as social smokers and continue due to the addictive properties of one of its components, namely nicotine. It does supply a rush of dopamine, although it’s negative effect on health by far outweighs this. The acronym ‘COPD’ refers to chronic obstructive pulmonary disease. 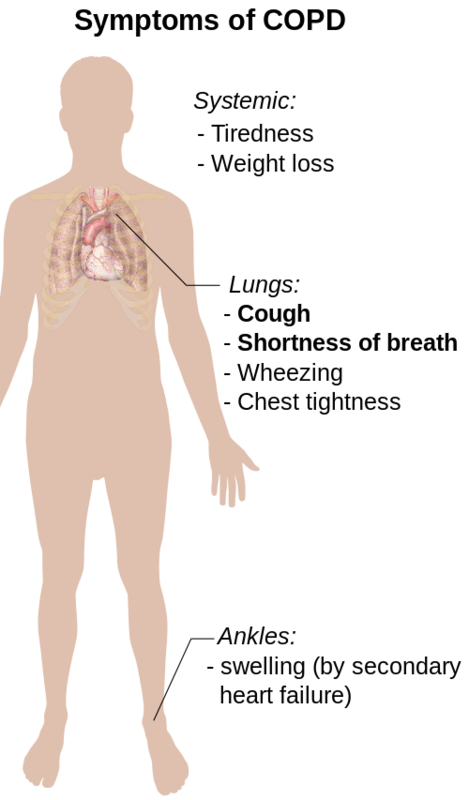 This is due to the reaction of the lungs to exposure to foreign or toxic gas and particles. It causes an airway obstruction and damage of the airways, epithelial lining, and the alveolar air sacs. Emphysema, bronchitis, bronchiectasis or even asthma can result from COPD. It is caused by the inhalation of harmful substances for long time periods or at high concentrations, for example, due to smoking, second-hand smoke, smog, industrial gases or fine dust or material suspended in the air. Smoking often originates from social reasons, such as experimentation or peer pressure. The effect of stress, genetics and family history may also play a role in people taking up smoking. COPD is caused by inhaling harmful substances over a long period, with smoking being the main cause, followed by second-hand smoke. The effects of smoking on the body are numerous and overwhelmingly negative. Smokers claim it relieves stress, suppresses appetite and induces comfort, on the other hand, it causes health issues such as infection, pneumonia and even serious diseases such as certain types of cancer, cardiovascular disease or COPD. During the early stages, many suffering from COPD are unaware they have the disease. The symptoms of COPD are a continuous cough for a long period, coughing up mucus, feeling short of breath, prolonged lung infection, a wheezing sound, lethargy, and weight loss. It may also exhibit symptoms in the rest of the body, including inflammation and cardiovascular problems. 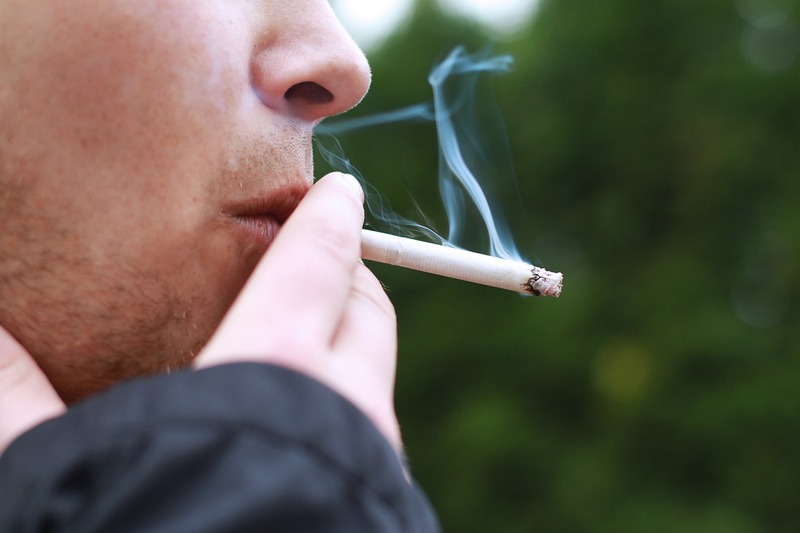 Certain stress cues and genetic or family history traits may increase the probability of taking up smoking. Social pressure or curiosity are also key initiators. COPD symptoms are enhanced by certain factors that can cause a periodic escalation in the disease. If not the prime cause, smoking can be defined as one of these triggers (for example, second-hand smoke), others include environmental gases, dust or smoke (collectively referred to as biomass smoke). Smoking harms the body in many ways and may lead to diseases such as COPD. It can also harm people around the smoker by secondhand smoke. The CDC reports that 80% of COPD deaths are caused by smoking. Depending on the contributing factors, COPD can often be very severe and result in deteriorating lung function, lower quality of life and heavy medical costs. It is also one of the leading causes of death worldwide. It is possible to quit smoking, just as it is possible to get rid of a bad habit. This will require considerable willpower and can be facilitated by a goal-orientated plan, medicines, nicotine replacement therapy, counseling or support groups (there are even online groups or stop-smoking classes). Those suffering from COPD should stop smoking and avoid secondhand smoke since it would greatly increase the rate and severity of the disease. Although damaged lung tissue cannot be restored, methods to treat the symptoms of the disease depend on the intensity thereof, which may include inhaled therapy, antibiotics or corticosteroids, oxygen therapy and in severe cases hospitalization for treatment. Smoking is an addictive social habit with deleterious effects on the smoker’s health, as well as impacting those around them with secondhand smoke. It eventually leads to various serious health problems and diseases. This includes chronic obstructive pulmonary disease or COPD. The respiratory tract becomes inflamed, the lungs damaged and the air passage is compromised. This can be worsened by further smoke inhalation or exposure to triggers. The best solution to minimize the damage caused by COPD is to quit smoking, while the symptoms can be treated with different medicines and antibiotics depending on the severity. Mardi Stratuss. 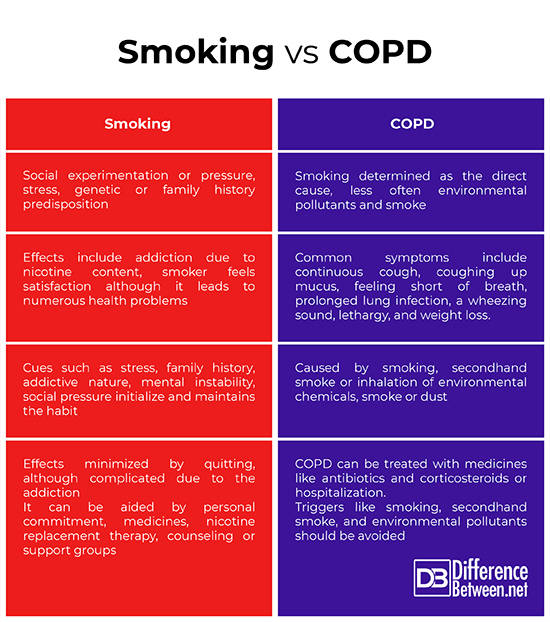 "Dfference Between COPD and Smoking." DifferenceBetween.net. November 12, 2018 < http://www.differencebetween.net/science/health/dfference-between-copd-and-smoking/ >. Centers for Disease Control and Prevention (CDC). “Cigarette smoking among adults – United States, 2006.” MMWR. Morbidity and mortality weekly report 56.44 (2007): 1157. Criner, Gerard J., et al. “Prevention of acute exacerbations of COPD: American College of Chest Physicians and Canadian Thoracic Society Guideline.” Chest 147.4 (2015): 894-942. Olloquequi, Jordi, et.al. “Comparative analysis of COPD associated with tobacco smoking, biomass smoke exposure or both.” Respiratory Research 19.1 (2018): 13.